Get Well Gabby | What a long and windy road we walk. What a long and windy road we walk. It’s been awhile since I wrote. Actually that’s not true, I have written numerous blogs and ended up not publishing them, destroying them. They were composed of Anger, sadness, despair and hopelessness. So let’s try again shall we? Right after you lose a child you hear many things. It seems everyone wants to give you advice. Some is sugar coated and some hits you right in the face with raw honesty. I have said repeatedly I don’t read these blogs. I put them on paper, publish and move on. However last night I found one I wrote on a website. It was the one I wrote the day after we lost Gabby. I don’t regret one thing I have ever said or written. I do regret one picture I posted on the site and to this day I still regret positing it. We were coming back for emergency shunt surgery for Gabby; I asked her to give me thumbs up and said if she did I’d get her a McDonald’s flurry at CHOP. The picture is devastating, she is a shell of the girl she was, sad, tired, in pain. I do wish I could go back and not have taken THAT PICTURE. Also when we got to Chop the machine was broke and I couldn’t get her that Mcflurry. A year plus later I realize it wasn’t fair to Gabby. I don’t want the world to remember her like that. I want them to remember the smiling, golden hair angel she was. At times people are upset, at times people have decided to disassociate themselves with us. In the last week four children I know or parents of children I know have lost their child to DIPG. Some of these parents have posted things I may or may not agree with. They have also been attacked for doing so. Let me tell you a secret….. It’s no one’s job to judge or decide what the right thing is to do. Everyone has opinions, you know the saying about opinions, Opinions are like A*$holes, everyone has them. Just like on September 12th 2011 I was riding go karts with my other daughters less than 24 hours after losing my daughter, others handle the loss in their own way. Agree or disagree, it doesn’t matter. My family wasn’t thinking clearly during that time, no one’s possibly can. Because no matter whom you are: parent of a healthy child, parent of a child of Cancer, parent of a terminal child….. You cannot possibly comprehend the thoughts and feelings going through our heads. It goes deeper than that, I can’t comprehend the thoughts and feelings going through another parent’s head that just lost their child and they can’t comprehend mine. What it comes down to is everyone’s pain is the worst pain to them and them alone. Carolynn, Madison, Kaitlyn and I have dealt with the worst pain to us! And a parent who just lost their child has suffered the worst pain to them. The problem with Cancer and loss is as it destroys families everyone in the families wants to talk about how much they hurt. It almost comes down to a comical contest of I hurt worse than you. What I’m about to say is my opinion and my opinion alone. Aunts, Uncles, cousins, Grandparents, etc. Although they hurt, I can’t believe they hurt as badly. Yes the pain is there. But what isn’t there is the image of the first time your child cried, walked, said DADA! What isn’t there is the constant reminder of the child you spent every day of your life with. Easter is Sunday, I need to be excited for the girls and Xander. But on the top of my mind, I can here Gabby screaming about finding the most Easter eggs during the hunt. And I’ll hear that every Easter for the rest of my life. Only a parent is going to have that as a constant reminder every holiday for the rest of their life. So I read that blog from September 12, 2011 less than 24 hours after we lost Gabby…. “2-3 months without treatment, 6-18 months with treatment” That’s what we were told. For the first two months Gabby was put through hell. A month in a hospital bed, followed by a month driving down to chop daily to be sedated for radiation treatment, weekly needles, daily medicines, at times we had to hold Gabby down and pour the medicine into her throat. The third month consisted of daily therapy, and another operation, countless CT scans, emergency room visits and still Gabby couldn’t cry. When this started we believed she could beat the odds, she would hit the 17th month and a new treatment would come out giving her more time. Another few years and another new treatment. We never stopped believing that would be how this all turned out. A miracle girl cured. Our other two daughters went through the hell of having invisible parents for three months, being shuffled from family member to family member, taking out their anger on one another. At the end of August we said we needed to get away. We traveled to the great Wolf lodge. Gabby was miserable the whole time. When we took vacation in the beginning of Gabbys life, and she was an infant. As she sat in her stroller and watched her sister’s play and laugh it filled her with smiles and giggles. She hadn’t yet learned that she could do the same thing. Fast forward almost six years and gabby is sitting in a stroller again, however this time as she watches her sister’s laugh and play she knows she used to be able to do the same. She knew what she was missing while as an infant she didn’t. She was trapped inside a body that was shutting down. She was helpless to stop it. We came home for one day before leaving for the beach. Again at the beach gabby was miserable. When we took her to the beach she would just close her eyes and pretend she was asleep rather than watch her sisters playing in the sand. The only thing she wanted to do at this time was eat and sleep. Unfortunately it was getting harder for her to eat. At the beach we noticed Gabby was a lot more lethargic, something was wrong, we called the hospital and they said bring her in. So her only real vacation was cut short, Carolynn and I drove Gabby to CHOP. She had a CTscan and we were told she needed a shunt to drain the fluid in her brain. I asked the doctor was the swelling due to tumor growth or tumor breakdown. She looked at us and said it was breakdown. We were overjoyed that was a good thing, even though it was just a guess on her part. She couldn’t tell for sure but all signs of improvement led her to that deduction. I had to drive down to the beach and pick up my other two daughters because I didn’t want to have to end their vacation as well. However Hurricane Irene did that anyway. Gabby stayed in the Hospital till Saturday and came home. Gabby kept declining, she was now having trouble eating her favorite ice cream sandwiches and even DIBS after the first few days, she also lost the ability and power to drink through a straw, and she would grab the cup and place it to her mouth and pour milk in. The milk would pour right back out. She was so thirsty but couldn’t swallow milk or at least much milk. Imagine being in a desert dying of thirst, you find a beautiful lake full of water however every time you tried to take a sip it would pour back out of your mouth leaving you still thirsty. HELL on earth. On Saturday Morning our middle child came down with a sore throat and was getting sick, we made an appt to take her in to get checked for Strep. That morning Gabby couldn’t even swallow ice cream. Carolynn called oncology and they said bring her in. I took Kate to one doctor, Carolynn headed to CHOP. It turned out Kate had strep. When Carolynn took Gabby to Chop we both thought it was a problem with her shunt, they would fix it and she would be right home. As Carolynn sat in the ER she told me to stay home with Kate and she would let me know more later. I received a call from Carolynn the doctors told her they were very concerned about Gabby and she should call me and have me get there fast. I arrived there at about10:00 pm. Gabby woke up looked at me; I hugged her, talked to her for a little bit and said I loved her. She then drifted off to sleep. Carolynn screamed JOHN; I fell off the couch to the sight of about ten doctors/nurses in the room with Gabby in a seizure. Her heart rate was over 200bpm. They looked at us and said do we want them to just let her pass away in our arms right there or should they put a breathing tube in. Of course we chose the tube. That morning we were told the tumor had grown, swelling was worse. They would treat her with more steroids and other medicine to see if swelling would go down and she would wake up. She was in a coma. The next several days we watched and waited, eventually gabby opened her eyes and looked at us. She couldn’t talk or move and wasn’t able to show pain in any of her extremities when they did tests. Eventually she did show she felt pain in one foot and one hand. This stay in the hospital was filled with numerous discussions and choices no parent should ever have. She had tubes and needles going into her everywhere, it was horrible to see this delicate flower so bruised, she still had a three inch incision on the back of her head and stomach that hadn’t healed and a week later we were back in the hospital with her. What happened to our plan? What happened to 6-18 months? The doctors came to us and said we had three options, perform basically two more unnecessary surgeries in our eyes to take care of the shunt infection ( it was a minor infection and wasn’t what was keeping her asleep) treating that would only help if she started to move and became alert. The doctors told us it wasn’t what was doing this. The second choice was just to keep her hooked up to everything, she had been given all these medicines for close to a week and nothing changed and they didn’t feel it would. The third was take out the tube and see if Gabby could make it. She was showing she could take breaths on her own so we decided to take out the tube. We talked about it two days before we officially decided. It wasn’t the breathing that they thought she would die from it was if she would be able to handle her secretions and basically not asphyxiate on them. The room was filled with doctors, they removed all her IV’s with the exception of her port, and we said we love you and goodbye. They removed the tube and placed her in our arms and left the room. We sat there quietly crying holding her tight listening to her breath. An hour later they came back and Gabby was still with us, still breathing, still fighting! Each night before the tube and the night after the tube was taken out we said goodbye to our daughter. Because each night it looked as she wouldn’t be with us when we woke, we were afraid to go to sleep, afraid to miss that last breath, afraid to miss feeling her leaving us. True Hell on Earth. The doctors told us she was dying we decided we wanted to take her home and let her be surrounded by us, her sisters and her puppy. There was nothing else they could do for her that we couldn’t do at home, with equipment the hospital set up in the house. We talked to her sisters the day before and explained that Gabby would most likely be going to heaven and gave them the choice if they wanted her at home when she went. I was surprised but they both said yes they wanted her home right away. We also let them know they should never give up hope and keep believing that a miracle was possible. We were supposed to leave Friday at1:00pm. Carolynn woke me Friday at8:00amand said the doctors had told her Gabby was actively dying and if we wanted to go home we needed to leave now. They couldn’t guarantee she would survive transport. Only one of us could go in the ambulance the other would have to drive home alone. Carolynn went in the ambulance, I gave Gabby a kiss, said I’m sorry and goodbye. I packed up and tried to get home. A portion of 76 was shut down so I had to take a different way home at time exceeding 100 mph, because I knew the way things are for us, I would probably not get to say goodbye and hug her again. Gabby’s new bedroom was our downstairs family room, equipment was set up their Carolynn and I slept next to her, neither of us wanting to close our eyes because we were afraid again each breath would be her last. We were by told by the nurse we should call a funeral home and at least be ready so we wouldn’t have to do it afterwards. I can’t describe the fear, the pain we felt watching our baby take breaths, deep ones, shallow ones, stop breathing for a second here and there. Wondering was that it? Did I miss it? Talking about should we have a private or public viewing, where we should have the memorial or celebration of life. The one thing that remained constant was each night we said goodbye to our baby, and each morning we woke up after we passed out from exhaustion and she was still with us. A friend asked me during this time was there anything we needed. I replied: More time. The more and more I thought about it I’m not sure I wanted that anymore, of course I didn’t want to lose by baby, however watching her, listening to her little heart beat so fast, working so hard I just wanted her to stop hurting. But every night we also clung on, believed, hoped for a miracle to happen the next day, that night, movement in the hands, eyes opening wide, anything, we never gave up that hope of a miracle. We didn’t take Gabby home to die, we took her home to be surrounded by the people who love her, away from the doctors, the ouchies, the hospital, we took her home and kept waiting for the miracle that she deserved. The day started like the last few, Carolynn sleeping on the bed next to Gabby me on the couch we pushed next to the bed. Her breathing was the same as it had been the night before, I had a dream the night before that she had woken up and was okay. Unfortunately it was just a dream. The girls went out with friends in the morning while Carolynn and I stayed to sit with Gabby. We talked and sang to her, Katie came home, got a shower then came downstairs with us. We put on the Disney channel. I laid on the floor as Katie lay in bed next to Gabby holding her hand, Carolynn on the other side of her. Carolynn said her breathing was slower now and it was getting slower all day. She went up stairs I looked at Gabby’s knees they had started to turn blue from lack of oxygen I would guess to her extremities. All her energy was being moved to her heart to help it beat. Carolynn came back to the room, I leaned over and whispered in Gabbys ear, I love you baby, your strong and beautiful and I’m sorry I couldn’t protect you from this. I said I love you again, told her she won’t hurt anymore, and to wait for us and one day we would come to her. Then I didn’t say goodbye I simply said see you later. Right after that she took her last breath at8:18p.m. She went quietly, no noise, her heart just couldn’t handle all the work anymore. Carolynn held her, Katie held her, I held her, we cried. Our baby was gone. I can’t describe the silence as Carolynn and I looked at each other and back to Gabby. I had to call the nurse to come and make the official time of death and unhook her from all the tubes, we told her not to come till 10:00. Maddie, Katie, Carolynn and I took turns singing her favorite songs to her, hugging her, talking about how she will always be with us. In our hearts. We should be honored we had her for five years. Gabby was right when she told me months ago that when she was six she wouldn’t be sick anymore. Her birthday is October 9th she won’t be sick that day. After the nurse officially pronounced her, you have to wait for the funeral parlor, it was important to us that she was not placed in a bag, and she wasn’t. We told them to give us 20 more minutes. The five of us sat downstairs each one of us holding her and singing songs to her. When the last song was sung, I picked her up, walked her out to the van outside, and placed her on the gurney. Kissed her as they covered her head with a sheet, kissed her again and said how sorry I was that I couldn’t protect her, how sorry I was for not being strong enough for her, and how she would never have to hurt again. They took her; it was raining and thundering, Gabby going out with a bang. Went to the funeral parlor to talk about the viewing, we are having a public viewing on Thursday September 15th; we figured we owed it to Gabby to honor such a special girl. We are also planning a big celebration of life on her birthday, as a friend of mine said, it will be Epic. Just sitting in a funeral home knowing your five year old is somewhere in the building on a table alone is enough to haunt you for the rest of your life, the fact that right after you need to go to a florist to get flowers makes it that much worse. When we got home the girls wanted to do something fun, we took them to ride go-karts and play lazer tag and arcade games. The whole time we had to have a smile on our faces for them, when they would run off Carolynn and I would just sit and stare blankly at the floor. This was all wrong, there are only two, and Gabby would have loved this. It truly sunk in when we were leaving and the girls were walking in front of us. Two of them, with an empty spot on the right of Madison where Gabby should be. Hell on earth. The day we took Gabby to Chop the first time we were supposed to go to Chucky cheese, she loved the place, I wish we would have taken her, we told her we would go later, in the hospital we told her we would go when we got out, she never got well enough and she never got back to chucky cheese. Neither Carolynn nor I want to drive the minivan anymore, it was bought right before Gabby was born for her, our family of 4 was becoming five and we needed a bigger car. We had her brothers come and take it away. It was too hard to drive and look and see an empty row. Earlier tonight I posted something on face book, and I’ll share it with all of you again. I simply stated that everyone who thinks she was in a better place was wrong. Her idea of heaven was playing with her sisters and getting hugs from her parents. God was the person who put her through three months of hell then murdered her. God’s plan was to take her somewhere better and leave her family in hell? I think I said something about I’ll show you a video tape of our family Christmas from last year and the one coming up, lets see the difference. Then I said God is a good guy sarcastically. The post upset a lot of people, some accusing me of asking for prayers the last three months and now spitting in gabby supporters faces, to others basically just calling me bad names. I deleted it, it is Gabby’s page and I didn’t want that Hate on there. Looking back at what I said I only regret one thing, actually one sentence. When I told everyone they were wrong. It was a statement. I shouldn’t have done that. I am open to all discussion and respect everyone’s view, that statement was close minded. I shouldn’t impose my beliefs on others and accuse them of being wrong. Everyone has the right to believe what they want. I mean Hell I’ve been shouting believe for three months. So I do apologize to those that I said were wrong. You are entitled to your opinion. So take that sentence out. However I still believe and stand behind everything else I said, if you choose to judge me, go for it. I promise I won’t judge you and be as close minded as some people when it comes to faith and religion. I welcome all your thoughts and prayers, my whole family does. Gabby touched so many people and my family and I appreciate all the support of the community, volunteers, face book followers and anyone else I am missing, I would never want to do anything to make any of you feel we didn’t appreciate it. We love you all. Just remember be open minded, when it comes to religion, take a breath and compare it to soda. Some people drink Pepsi, I just choose Coca-Cola… My miracle was having five years with her, she was the true angel. But she isn’t in a better place in my opinion; a better place is sitting on the couch with her sisters and me playing Mario kart on the wii. Now what? I have no idea, so many things we regret, so many horrible things we remember. Gabby last said I love you to me June 2nd at7:00pm. I have it recorded on my phone, I’ve played it a hundred times since this started, I’m addicted to hearing my baby say it for the last time, how many people can honestly say they know the exact time someone said I love you. It’s a date burned into my mind. Am I angry, of course I feel what happened to Gabby is no different that someone waking up walking outside and randomly killing someone, murder is murder. Again my belief, not trying to impose it on anyone else. She was cheated, murderers and rapists walk the streets yet she was taken, not just one person died that day we all did. Gabby didn’t want to be part of a plan, she wanted to play guitar hero with her sisters and fight me for the cake batter bowl. She loved monster high dolls, last year she was Frankie Stein and I was Frankenstein, this year she was going to be Claudine wolf and I was going to be the wolf man Last year our older girls ran ahead and even in the cold and the rain, Gabby and I went to ever house in our neighborhood, her sisters quit ½ hour before us, that’s the type of determination she had. I can’t even bear to think about Halloween now. We were going to Disney to stay at the Polynesian and go to Disney and Universal through the make a wish foundation. That can’t happen now, it was her wish. My girls asked me are we still going. I can’t bear to tell them probably not. We have a stacks and stacks of bills to pay, Life is still going on, and mortgages have to be paid. Actually we can’t even open the bills yet, we keep saying tomorrow. How do I explain we now can’t go to Disney and stay on the beach where they will do Luaus? We told make a wish we wanted that hotel, because if Gabby was too sick to go to the park she could still see the fireworks over the water. Going back to work is terrifying to me, but it has to happen, as I write this Carolynn just came running in crying clutching Gabby’s blanket, screaming I want my Baby back. What do you say to that? What would the religious tell a grieving mother holding the blanket that gabby wouldn’t let go of for five years. As she screams I want my baby back? Would they say: it was god’s will and we have no right to her? Would they blame it on Satan, would they tell us she was placed here to be an example of how one child can bring so many together? None of those answers will bring peace to a grieving family. I want to run away, get a job where you don’t have to worry about it when you go home, there are no sales quotas or numbers to hit, and I want to live life, enjoy life, and enjoy my family. I spent more time at work than I did with Gabby during her five years of life, I will take that thought to my grave. So maybe running away to the beach, getting a jeep, starting over but never forgetting is the answer. I’m not sure, all I know my house scares me; I don’t like being in it, all the happy memories only lead to sadness. The website and the face book page will be kept up. I will blog and maybe the next one will be about the happy moments, Right now I just can’t think of any of them and am afraid to watch old video tapes of her. On that note I won’t say goodbye, I’ll just say see you all later. Never take them for granted, they could be gone tomorrow or five minutes from now, never forget that. Even years after this, let gabby have taught you that, WORK, money, status. None of that is important family is. Go hug someone right now. As I said I haven’t read anything I have written. But I read this one with tears in my eyes. Do you know the one thing at stuck out in all of the sad and horrible things in that blog? The fact that the day after we went to the funeral home saw our daughter, made arrangements and went home. I remember none of that. But what really sticks out is that we took Maddie and Katie to an arcade and Go Kart racing on the 12th. I can’t believe we made it through that! Carolynn and I are on medication (surprise!) We understand it won’t cure anything but right now it’s needed. We also see a therapist. Maddie and Katie do as well. The thing that gets me is how did we get through that day? The day after such a vital part of our live was ripped away so quickly, how did we function? I have told Carolynn the sisters have it worse. They don’t have the benefit of anti-depressants that we do. And this may cause some back lash but I don’t want them on medication. Some of these anti-depressants destroy short term memory. They go to play therapy and Art Therapy. Each day since September 11th 2011 they have woken up and go on. They handle it in their own way. Sometimes I want to ask: How can you just act like this didn’t happen? How are you not missing her every minute? Of course I don’t, when they are ready to talk they will. And we will be here ready for them. It’s my opinion they do these things because what it comes down to is our kids are stronger, more resilient, they will always hurt, but they go on and make the best out of life. This is no difference whether they are healthy children or ones fighting illness. Children are the true warriors, the true brave knights and princesses of the modern world. I get the sniffles and I expect to be taken care of. I’m a 39 year old baby. I could never have been as strong as Gabby, or her sisters. They had no choice; they faced it and kept moving. My biggest struggle has been that every day I wake up and a piece of me is gone. (No different from my daughters or wife) and everyday for the rest of my life that piece will be gone. I used to say the girls whenever I referred to them. But there were three girls, now I say Maddie and Katie. Because the girls were always three. When I went to the store I would always get three of everything, now it’s a constant reminder I’ll only get two. This is another pain other members of our family don’t experience or probably even think about when they are shopping for their own children. Crying every time you walk down a toy aisle, every time a little girl walks by that looks five. I broke down in my therapists’ waiting room the other day because there was a little blonde hair girl doing her homework. Something Gabby won’t get the chance to do. Gabby would be 7 right now, I had a facebook page and I decided to get rid of it. I just couldn’t look at the little girls that Gabby went to school with turning 7, losing teeth, going to first grade. Because the truth hurts. They may have been Gabby’s best friend before May of 2011, but two years later they have moved on, and one day she will be a distant memory. I understand it, I’m forgetting things, things I need to right down. I wish I could hear her voice, feel her hand and smell her hair as I kiss her before bed and then sing three songs to her. I can’t. We have one pillow we have sealed in a bag. It still smelled like her right afterwards. Neither Carolynn nor I want to open it because not only are we afraid that we will lose that smell, but more importantly that the smell is probably already gone. Then we will beat ourselves up for not smelling It every day till it that smell was gone instead of wrapping it in a bag. So in closing, people tell you the second year is worse. It is…. I cry daily, even more now that Xander is born. I look at him, the way the girls coo over him and in my mind I can picture her smiling saying “HE’s CUTE! I wonder sometimes if the crying is good, I wonder when will the pain stop, the anger, the constant feeling of missing a piece of me. I don’t believe it ever will. But I go on. I wake up; I shower, put on a suit and talk to people about trivial problems every day. When behind my smile I’m thinking: you have no idea. Again it’s not my job to scold those who complain that the biggest problem they have is rising taxes or a transmission going. I would trade places with any of those people and be oblivious. In the past I went through the angry at normal people phase. I came out of it and realized how ridiculous it was. 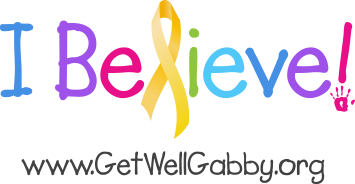 The Get Well Gabby Foundation was formed with the intention of one day making sure that those things were the biggest problems in life, not the fact that their daughters shunt was clogged and there is danger of a seizure. So yes the last year plus has been long and windy. We have had ups and a lot more downs. The hope is as the years go down the number of ups rise in our favor. We recently had a beautiful Baby Boy. And we formed The Get Well Gabby Foundation a registered 501(C)3 non profit corporation. We have raised funds needed to support a major project at a local children’s hospital (more news to come by the end of April!! ) we have supplied over a 1,800 books to 3 children’s hospitals oncology departments. And we keep going. This year we are planning another 5K, Gabby’s Celebration which will hopefully be much bigger and better!!!. We are still trying to come up with an official signature foundation event. We are also always looking for people who want to run foundation “chapters in different states”. If you would like to discuss the possibilities with us please visit the site and email us. Either Carolynn or I will get back to you. Plans are in the works for possible Golf Tournaments, additional 5K’s as well as a GALA. Also the Cure Search walk is coming to Philadelphia in June!!! Join us as a walker on Gabby’s Believer team or you can become a virtual walker. Directions are on the website Getwellgabby.org. Please visit the site, donate, purchase a shirt, remember we are 100% not for profit! We donate everything! so have your company sponsor an event, or give the gift of a donation for your next loved ones birthday. We lost our Gabby, She didn’t get well. But the Get Well Gabby Foundation will continue with your help and donations to make sure someday, somehow we will say: We helped them Get Well. Be there with us when we do! This entry was posted in Gabby's Daddy's Blog, Uncategorized by John. Bookmark the permalink. I just want to say that you come to my mind often, so I wanted to check back and see how things were going. I didn’t read your blog until after Gabby had died, so I kind of read it in one huge session. The thing I appreciated was how honest you are about your feelings. I haven’t lost a child, so I have no idea what you have been through. I have two sons with severe autism and mental retardation, so I do spend a lot of time fielding well-intentioned comments from people and trying to figure out how to react (it usually drives me nuts, but I try to hide it). So many parents of kids with disabilities seem to write these really wise, Zen types of blogs and books. i cannot get to that point. I appreciate finding the occasional writer who admits that they are angry, that they are jealous of people with healthy kids, and they aren’t “better, more fulfilled” people because of the whole experience. Anyway, I don’t really know what my point is, but hang in there and hope the days gradually get easier. I came to this site today looking for a possible date of the 5K you sponsor and I read this blog. . . . I have not been in contact because I empathize with the pain you still feel. Though I feel like I am a part of your lives through Gabby ~ you do not know us. . . But after a 14 months I am ready to share with you. . . I have had the honor of living in a house that is extremely special to many people. I open the door to the bedroom and imagine her playing dolls on the floor with her sisters. There is a small white bag under the sink with ‘Gabby’ stamped on it and I imagine her attending a birthday party and bringing home ‘special surpises’ in the bag. As the flowers came up this spring I thought of how she must have helped picked them out, plant them and await their blooms. A single purple tulip is my favorite and I see her face and think of her sweet soul each time I pass it. I see the blooming dogwood tree and imagine how she searched for Easter eggs under it each year. I pick strawberries and wonder how many times she tasted their sweetness. I see the area in the yard where, I believe, the swing set was placed and I see Gabby playing with her sisters. Swinging back and forth in innocence and saying ‘higher – higher’ . . . . Never imagining how high she would soar in life and how her short life could impact so many. I am grateful to know the story of the lives in 17 Dianna Drive before my family was given the opportunity to be a part of this journey. Mike shared Gabby’s story when we moved in & I knew at that moment we were chosen for reasons beyond being “just a tenant.” If, at any time, you need to return please know you are welcome and we will accomodate anything to assure you are given the time and space necessary.